Jaguar Land Rover has harnessed advanced digital technology to offer its customers virtual hands-on access to its model ranges. The system, Virtual Experience, is the most sophisticated yet produced for the motor industry, enabling interaction with an almost 1:1 scale representation of any Jaguar or Land Rover model. Using a touchpad screen, the customer can select model, equipment grade and feature preferences, which Virtual Experience renders as an ultra-high resolution, real time 3D image and leveraging a ground breaking five million polygons. The customer makes natural and intuitive movements or gestures to explore all aspects of the vehicle. The technology may be sophisticated, but the equipment required to present the Virtual Experience is simple and portable. It requires a display screen and a laptop loaded with the system to operate. This means it can easily be set up in vehicle showrooms, public spaces, even the sides of buildings, bringing Land Rover models to locations where there might not be enough space or access for a vehicle. JLR’s technology department has led development of the system, moving on from an initial challenge set by company CEO Dr Ralf Speth in December last year. Working alongside marketing, design and engineering departments, and with external suppliers, the project was steadily refined to ensure that the technology deployed would co-ordinate perfectly with JLR’s systems. 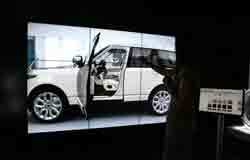 The Virtual Experience was demonstrated publicly for the first time at the reveal of the all new Range Rover in September. Virtual Experience featured on the Land Rover stand at the Paris motor show, supporting the launch of the L405 Range Rover.